I love, love, love when we get suggestions for things to post on the site. Today's amazing suggestion comes from often-mentioned Bride-To-Be, Kate. Not only is her suggestion a lovely way to decorate your house/apartment/dorm, but it's a fantastic present pick! Kate told me all about the store, Fishs Eddy, when she passed it in Manhattan, and hooked me up with the website. Since that moment, let's just say I've been mildly to extremely obsessed with the items that they are selling. 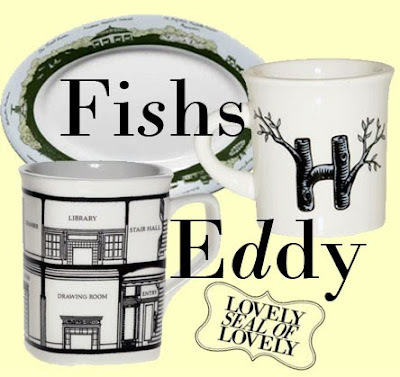 Fishs Eddy is a home decor/dinnerware/t-shirt/accessories store which features unique, gorgeous, and slightly quirky gifts for you, your home, and your loved ones. After browsing around the website for what seemed like hours, I came up with a list of my favorite gift items that I would love to give (and might actually give!) this season. First of all, let me just say that the normal prices of the items are great--nothing too outlandish and scary. However, Fishs Eddy also offers their Discontinued Patterns at a much lower price, and has a fantastic sale section. The Central Park Small Oval Tray (6 inches) is adorable, and very original. This would make a great accompaniment to a present for your favorite New Yorker (and it's only $5.95!). Or, pair the tray with the Central Park Mug ($9.95) for a complete gift set highlighting New York's most famous park. I simply adore all their Alphabet dishware; I would love to get everyone in my life a mug with their initial neatly drawn on it. And, at $5.48 for the mugs, I could get all my loved ones a lovely little mug as a stocking stuffer, or present. If getting someone dishware isn't really your thing, than check out their very cool t-shirts, or tote bags (totes range from $5-$18)--I especially love the Memo Tote Bag (which is on sale for...$2.98!). Some of my personal favorites from Fishs Eddy include the Floorplan Dinnerware items, The Polka Dot Dinnerware, and as a teacher, I fell in love with the Memo Pad items...how original! Check out Fishs Eddy's website, because it just may have that one gift you couldn't find anywhere else!